View More In Gun Parts & Accessories - Page 4. Telescoping Monopod in a full-size model. A little help never hurts. Whether hiking or hunting, the Telescoping Monopod is a real friend to lean on when the terrain gets tough, or when you need solid support for a precise shot. Tempered aluminum construction is very light but incredibly tough. 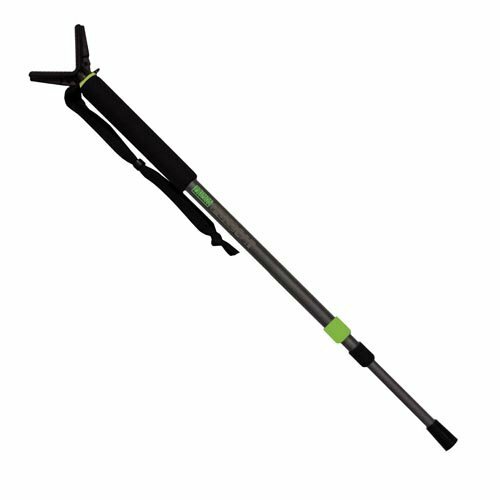 The Posy-Lock pole-adjustment system gives it the strongest and most reliable locking system out there, so it won't give in with hard use. The full-size model from 25 Inch to just over 5 feet. Super lightweight and feature oversized, high-density cushion hand grip, detachable woven nylon wrist strap, all-terrain carbide tip that grips rock and ice, removable rubber tip that grips hard surfaces, detachable "V-yoke" with rubber over-mould, camera stud with aluminum take-up wheel, 3 telescoping sections, anodized finish to resist corrosion.